Just minutes ago, President Trump took the stage at CPAC and began his speech to an enthusiastic crowd with a dose of self-deprecating humor, first joking how he loves to watch that guy on the screen (himself) speak. 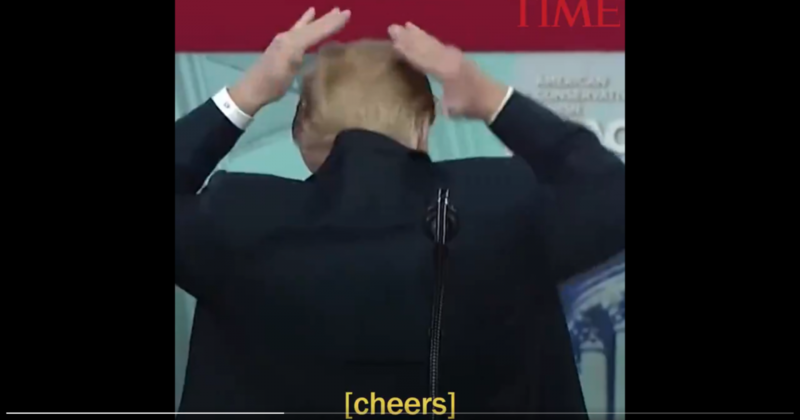 He then began a primping routine, treating the howling crowd to a 360-degree show of preening his world-famous coiffure, turning from one side to the other, then completely around, all the while imitating grooming his hair to perfection. “I try like hell to hide that bald spot, folks! I work hard at it,” joked the president before moving on to more serious topics.